The exclusive villa is fully equipped and is located near the lake shore. Very spacious terrace and balcony areas offer guests any time of day is an ideal place for relaxation. The villa is suitable for max. 7 people designed. The ground floor features a spacious living room with sofa-bed, satellite TV and a large dining table with enough chairs. The adjacent kitchen is fully equipped with dishwasher, dishes, stove, oven, refrigerator. The ground floor 1 toilet. A very large covered terrace is off the living room - also with a large table and chairs, sun loungers. There are 2 more small terraces and a large, fully enclosed garden with private pool. On the 1st floor there are 3 bedrooms - 2 with double bed, wardrobe and chest of drawers, 1 bedroom with bunk beds, 2 bathrooms and a large balcony. In the basement, the Taverna is a shower room with toilet. Here could be provided on request, additional beds, we do not empfhelen this. It should be noted that these two chambers are not daylight window and received by an electrical supply of fresh air ventilation. The house belonged to a large garage (2 parking spaces) that also garaging for bicycles and water sports equipment. The house is new, equipped with autonomous heating and can also be hired outside of the summer months. The villa is completely secluded in a small side street about 10-20 minutes walk from the lakeshore. Numerous restaurants, cafes and some shops are within easy reach. 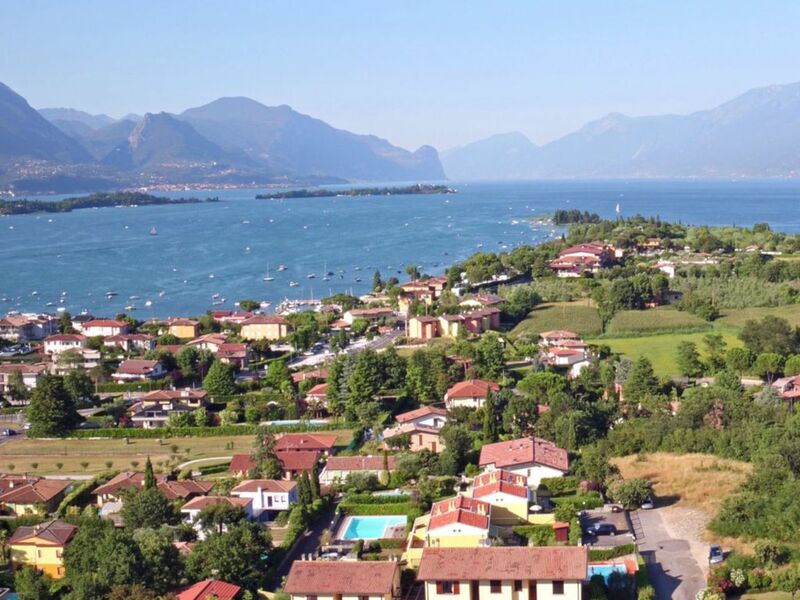 Manerba del Garda consists of several villages, idyllic lined up surrounded by olive groves and vineyards together. The shore is very picturesque with the dominant rock Manerba which drops down perpendicular to the water and is the landmark of this area. On a clear day one has a magnificent view from above on Punta San Vigilio on the opposite bank. Other attractions in the 'Rocca' are the remains of the castle, which belongs to an archaeological nature park of 9 hectares. In front of the place is covered with cypress island of San Biagio, which is accessible through the shallow water on foot and offers great beaches. The small port 'Porto Tochio' with its small restaurants and cafes as well as the center of Pieve Vecchia Montinelle and are easily accessible on foot. Golf: The golf club 'Arzaga Golf' or 'Garda Golf - Coutry Club' are located only a few kilometers away. Costs from 02.05. to 09.09.2019 - stream € 70,00/week. Costs outside the above periods depend on the seasons. Tourist tax depends on the municipality and must be paid cash in loco.